WATKINS GLEN, New york – June 30, 2014 – Doran Racing’s #14 Nissan NISMO 370Z RC driven by Brad Jaeger and B.J. Zacharias came within 0.169 of a second of winning Saturday’s IMSA Continental Tire SportsCar Challenge race Saturday at Watkins Glen International. The second-place finish was the team’s best result of the season to date and it will go down in the record books as another thriller for the Lebanon, Ohio-based team at this storied road course. With 40 minutes to go and 40 laps down in the 2-hour-and-30-minute race, Zacharias was in fifth place, but he was a whopping 12.008 seconds behind the fourth-place car at the time, a Porsche driven by Matt Plumb. The top four cars, which consisted of three Camaros and that Porsche, were fairly close together on the 3.4-mile, 11-turn road course, but that was a big gap to overcome to reach them. Zacharias had his head down and the bit in his teeth, however. The Cincinnati-based driver set the car’s fastest lap of the race on lap 42 with a time of 2:02.684. By lap 46 with 30 minutes to go he’d cut the margin to 7.387 seconds, but he was still fifth and a podium finish still seemed out of reach. With 19 minutes left in the race and 51 laps in the books Zacharias was still fifth, but he had cut the gap to Plumb to only 1.971 seconds. With 13 minutes to go and 55 laps down he passed Plumb to move into fourth place and draw within 0.435 of a second of the third-place car, a Camaro driven by Andy Lally. He passed Lally on the following lap with 11 minutes remaining to move into third place behind two other Camaros driven by the leader and eventual winner, Robin Liddell, and Lawson Aschenbach. Zacharias passed Aschenbach for second place on lap 59 with just 4 minutes remaining in the race, which put him 5.012 seconds behind Liddell, who shares his Camaro with Andrew Davis. Zacharias was still 2.387 seconds behind the leader when he took the white flag while completing lap 61. Some slower cars the leaders were lapping hindered him for a bit but later they helped him, as he was able to draw up to the eventual winner and even aside of him momentarily. He took the checkered flag just one-tenth of a second behind the winner. 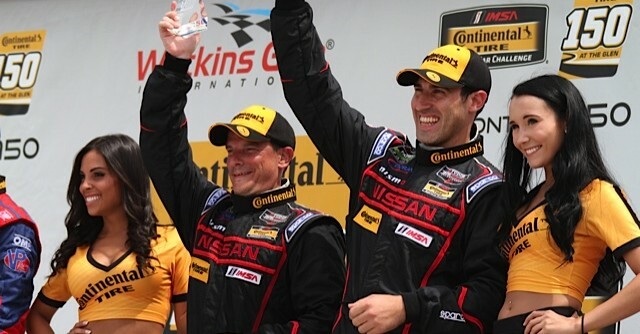 Plumb, who co-drives with Nick Longhi, ended up third, more than 10 seconds behind the Doran Racing Nissan. Zacharias said one of the turning points in the race was actually lap 37, when the team made its second and final pit stop and team owner Kevin Doran elected to replace just the left-side Continental tires on the Nissan. He also brought his car in a couple of laps after some of the car’s closest rivals in order to be sure the car would have enough fuel even if there were no more caution flags. There weren’t any, but the Nissan still had enough fuel to go the distance. Zacharias was ninth after that final pit stop, but he was back up to fifth shortly thereafter due to others pitting around the same time. Jaeger, of Charlottesville, Va., started the car in eighth place and ran in seventh or eighth throughout his stint. The first part of the race was plagued with cautions, but Jaeger was able to avoid any trouble. He was seventh when he pitted under yellow on lap 18 with 52 minutes gone, and Zacharias started his stint in 14th place. The team’s #41 Nissan also had a memorable day but unfortunately it was for an entirely different reason. John Farano escaped serious injury but the Tower Events Nissan 370Z suffered extensive damage when it was involved in a multi-car accident as the field came down to take the initial green flag. It was a huge disappointment for the whole team but especially for Farano and his co-driver, David Empringham, who are both based in Toronto. Farano had set the ninth-fastest time in qualifications and both drivers felt they had a car that could have been on the podium too. They’ll hope for a home-country boost when the series crosses the border for its next event July 12-13 at Canadian Tire Motorsports Park. The Watkins Glen race will be shown on Fox Sports 1 at 10 a.m. EDT on Sunday, July 6. For more information on Doran Racing, see DoranRacing.com. The team also has a Facebook page. Brad Jaeger: “It was a great race! During my stint there were a bunch of yellows so it didn’t feel like I raced much at all, but it was good. The team did a great job. This team is so good because Kevin really listens to the drivers’ feedback. The car at the beginning of the race wasn’t as good as it was at the end of the race, but he kept working with our feedback and made tire-pressure changes and other changes and we ended up only about 10 feet away from a first-place finish! It was amazing! “As the weekend wore on the track changed, but the adjustments the team made gave B.J. a great car for the finish. “This gives a great boost to our confidence. The Nissan is well suited for this track, especially in long, green-flag runs. B.J. Zacharias: “Kevin [Doran] had great race strategy. He made a call for a tire-pressure adjustment and to take left-side rubber only on our last stop, and he brought us in a couple of laps after some of the other cars so that we’d be sure we’d have enough to go until the end with our fuel window. “As far as the tires go, what’s most important at Watkins Glen is the right-hand turns, and putting just left-side rubber on helped us with the right-handers and it helped our understeer. “The Camaros were turning much faster lap times than we were, but we stayed steady and were able to catch them. We crammed as much fuel as possible in too. Liddell ran out of gas on the cool-down lap. We still had six-tenths of a gallon at the finish. It was pretty close, but it was enough. “We had a big gap to overcome, but I just put my head down and drove. “The ST traffic at the end helped us some and then again it didn’t. I had a bunch of traffic that held me back right where I didn’t need to be held back. There were five or six ST cars around us at the finish. I hit a curb and got sideways, but it was all good. The last three corners on the last lap we were nose to tail and even side to side; the last three corners were pretty entertaining. “The track wasn’t that bad but it just wasn’t a very fast track. We stayed consistent. I think we had the best-handling car at the end of the race. David Empringham: “It was a good day for B.J. and Brad. It was a disappointing day for John and I because we got caught up in the accident at the start-finish line on the initial start. It all started before the green flag, actually. “They have another Nissan that we might use for Mosport. We’ll see. Kevin is pretty amazing with how he can turn a car around.